Bruce Jun Fan Lee (李振藩, 李小龍; pinyin: Lǐ Zhènfān, Lǐ Xiăolóng); icha Bruce Lee, sutiyuq runaqa (* 27 ñiqin ayamarq'a killapi 1940 watapi paqarisqa San Francisco llaqtapi - 20 ñiqin anta situwa killapi 1973 watapi wañusqa Hong Kong llaqtapi) huk USA Hukllachasqa Amirika Suyukuna kuyu walltaypi aranway pukllaqmi qarqan. Taytan: Lee Hoi-Chuen (李海泉); Maman: Grace Ho (何愛瑜). Warmi: Linda Emery (*1945) (1964-1973). Yachaywasi: Tak Sun School (德信學校) 218 Nathan Road, Kowloon, La Salle College (喇沙書院) (1951) wan St. Francis Xavier's College (聖芳濟書院). Edison Technical School (Seattle Central Community College, Capitol Hill, Seattle). Alma mater: Washington Yachay suntur. Commons nisqapi suyukunata uyarinakunatapas tarinki kaymantam: Bruce Lee. [www.brucelee.com Bruce Lee Uficial qillqa web, (inlish simipi)]. Dragon Bruce Lee (Kastilla simipi). Fragmentos de The Lost Interview Fragmentos de la última entrevista realizada a Bruce Lee 9 ñiqin qhapaq raymi killapi 1971. 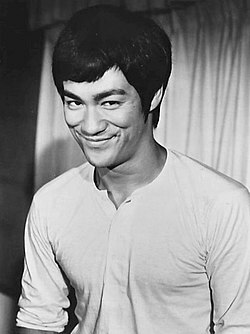 Bruce Lee Web Portal (Kastilla simipi). Bruce Lee: ¿el hombre más fuerte del mundo en relación a su peso? Kay p'anqaqa 04:36, 22 may 2017 qhipaq kutitam hukchasqa karqan.